When Katy Perry teamed up with Eylure and released a small collection of eyelashes, they became a massive hit. I've not tried them myself, though I keep meaning to but I've heard nothing but good things about them. Plus I find Eylure the easiest to apply. I just came across these new beauties. The Katy Perry Color Pop collection. 'A pop of colour for your lashes'. They've switched up the packaging and gone somewhat retro with the pop art imagery. It just screams Wonder Woman x M.A.C to me (which is a good thing)! 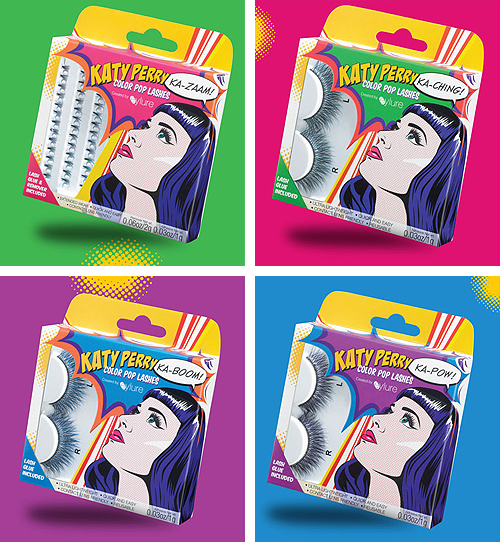 These lashes were personally designed by Katy herself to give fans a splash of colour on their eyes. These include purple, blue, peacock green and some individual lashes too. Coloured lashes can be quite garish and scary but these are really subtle as the coloured lashes re scattered between lots of black ones. Unfortunately for anyone outside of the US, these aren't yet available. Though hopefully they will make their way overseas soon as I really want to try them. Edit - I just noticed the Eylure UK Facebook page has a tab announcing the arrival of these lashes. No information on price, stockists or when they'll be available but I'll update when I find out. One last edit - Eylure UK have revealed that they'll be on sale in January in Boots and Superdrug (dates below). No idea of price range but I should imagine they'll be in the same bracket as the original collection.